Beulah, MI - Shoe-horned between the famous Manistee and Grand Traverse Counties, Benzie County offers golfers and non-golfers alike respite from the daily grind, along with all of the best that Northern Michigan has to offer. Despite its lack of name recognition, when it comes to golf, fishing, boating, shopping or simply relaxing, Benzie County takes a back seat to none of its more well-known neighboring counties. So why haven't 70 percent of you heard of Benzie County - or the charming little town of Beulah - before? Well for starters, the county motto "Northern Michigan Preserved" was coined for a reason. According to Diane Elliott, innkeeper of The Elliott House Bed and Breakfast and proprietor of the Elliott Mercantile, both in Beulah, "When you come to Benzie County, you take a step back in time. There's no traffic, no hustle-bustle." If you've ever tried to fight your way through the congestion in Traverse City, Benzie sounds like Nirvana. But this doesn't mean Benzie doesn't have plenty to offer tourists, or that the local folks don't want to share their own little slice of heaven with down-staters. 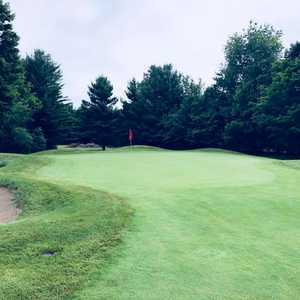 The county boasts no fewer than eight public golf courses, including the cushy Crystal Mountain Resort's two 18-hole tracks (800-968-7686), and two courses that represent some of the best bargains in Northern Michigan: Pinecroft Golf Course (231-882-9100) and Champion Hill Golf Course (231-882-9200), both owned by life-long Benzie resident Lee Stone. 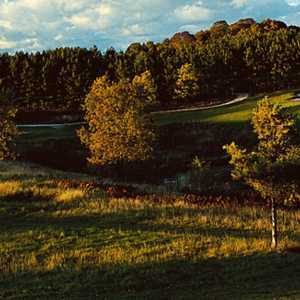 Other Benzie courses of note are the acclaimed Mistwood Golf Course (27 holes, 231-275-5500) and linksy Heathlands Golf Course (231-352-4101). And just outside of Benzie County lie the big-name tracks in Traverse City and Manistee County, including High Pointe Golf Club and Arcadia Bluffs. But Diane Elliott is quick to point out that golf isn't the only draw in either the town of Beulah or Benzie County. The lakes, even more than the links, bring people to this part of the Lower Peninsula. Beulah itself sits on the sandy shores of Crystal Lake, so name because of the dazzlingly clear water. The fishing and water sports to be had on Crystal Lake, the two Platte Lakes, Portage Lake, and Lake Michigan are equal to any other resort area in the state. "In 1873 an ambitious but ill-advised project was put through in an effort to connect Crystal Lake and Lake Michigan with a navigable channel. The original level of Crystal Lake was, at that time, much higher that its present level. The project was a complete failure in respect to its accomplishing its proposed purpose. The result was the lowering of the lake and exposing a wide stretch of beach around the entire lake and making possible the development of Crystal Lake as a resort and residential area as well as the site of the village of Beulah." Today, Crystal Lake is 9,711 acres (2,000 acres less than in 1872), eight miles long and two to three miles wide. And, thanks to the old coot who wanted to drain it, idyllic for summer vacationers. Accommodations in this part of the state are not exactly plentiful (Golf Digest recently described Arcadia Bluffs as being located literally beyond the end of the world). But, aside from expensive resorts like Crystal Mountain, the area offers some of the finest bed and breakfasts in the state. A personal favorite is The Elliott House in Beulah (231-882-7075), owned an operated by Diane and Pat Elliott. Diane and Pat opened the Elliott House in 1999, only 63 days after buying the turn of the century home. In those 63 short days, they transformed a lovely, single family home on the beach of Crystal Lake into a cozy three-bedroom bed and breakfast, replete with quaint antiques, locally produced artwork, and a wrap-around porch overlooking the lake. Especially noteworthy about the Elliott House is that each bedroom (ranging in rates from $79-99 a night) has a private bath and a view of the lake. The "continental-plus" breakfasts feature local baked goods, and if you want to stay for an extended period of time, the Elliotts also rent a two-bedroom cottage (the Shamrock Cottage) on the other side of Crystal Lake, complete with kitchen, dining and living rooms, picnic area, beach access, and an additional bunkhouse that sleeps two comfortably. "We're much more on the comfy-casual side," says Diane, "as opposed to the Victorian atmosphere you find at some other B and Bs." In fact, as soon as Diane, Pat, and their charming daughter Kelsey meet you at the door, you do feel like part of the family. The Elliott House is the perfect home-base for exploring all of the attractions that Benzie County has to offer, only a few of which we've touched on here. Just minutes away are natural and historical sites such as Sleeping Bear Dunes National Park and Point Betsie Lighthouse, one of the most photographed lighthouses on the Great Lakes. And if pop culture is your gig - or if you just love good, clean, family entertainment - you simply must check out the Cherry Bowl Drive-In Theater (231-325-3413), one of only seven remaining in Michigan. The Cherry Bowl shows no film above a PG-13 rating, and features an expended snack bar, play areas for the kids, Hula-Hoop contests, Elvis impersonators, putt-putt golf, beach volley-ball, and a dog-run, where your best friend can "work out" the gourmet doggie treats sold at the snack bar. If President Bush wants to bring back family values, he should rethink that tax break and spend some money on building drive-ins like the Cherry Bowl all over the nation. For big-city folk, it's hard to imagine so much activity, so many diversions, and so much beauty in one little corner of Michigan - especially if that corner is some place you've never heard of. Truth is, however, fun is where you find it. And you can find many summers' worth in Benzie County. This is close to being a place that time forgot. And as much as the local merchants and golf course owners would like to grow tourism in the area, I personally hope it remains a bit out of the way.